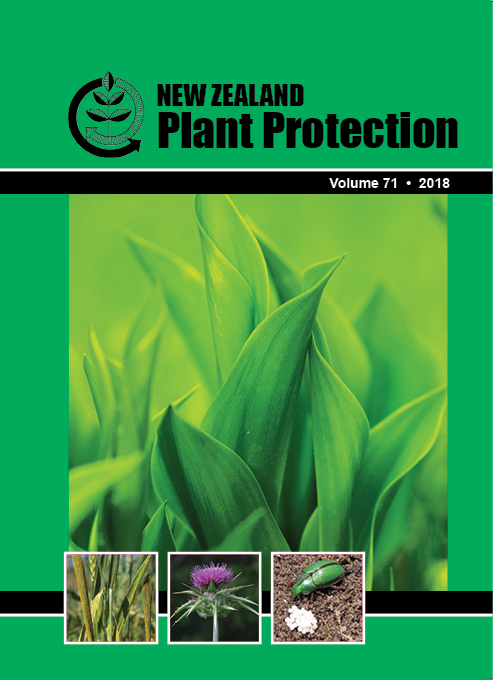 Ethyl formate (EF) is a Generally Recognised As Safe (GRAS) alternative to methyl bromide, with potential to control surface pests on New Zealand avocados before export. "Hass" avocados, two-spotted spider mites (TSM) and oleander scale (OS) insects were fumigated with 1.2% EF (240 g VAPORMATE™/m3) at 6 °C for 1, 2 or 4 h. Fruit were then stored at 5 °C for 3 weeks before external and internal fruit quality assessment. Survival of pest species was assessed 1 or 7 days later. Fumigation with 1.2% EF + 10% CO2 for 2 or 4 h controlled all life stages of non-diapausing TSM and all life stages of OS, apart from crawlers (0.3-0.7% survivorship). Diapausing TSM were harder to control (17% ± 4.8% mortality; 4-h treatment). Ethyl formate treatment resulted in damage to avocado skins (41% ± 5.3% – 91% ± 2.0%), and an increase in vascular browning and rots. The EF fumigations of avocado fruit at doses used here have potential to control non-diapausing mites and scale insects, but treated fruit were of unacceptable quality. Future studies could examine whether prior cool storage could reduce fruit damage.